Summer is all about living outdoors - enjoying the fresh air, flowers & sunshine! We eat just about every meal outside this time of year ... and the kids love it! 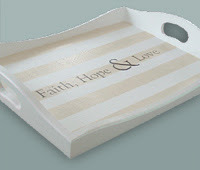 Serving trays are essential to making this easy - whether you're entertaining or enjoying a quiet backyard moment alone. For this look, I primed, then painted 2 coats of white gloss. Simple painter's masking tape will allow you to whip out some neutral stripes. 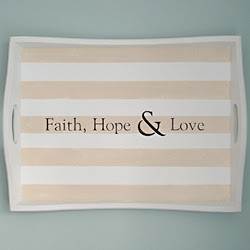 Add your unique touch with some alphabet stencils - "Faith, Hope & Love." Then, you MUST finish with a sealer, so you won't damage your art with condensation & drink spills. turned out beautiful! i recently bought a tray but have yet to paint it. You are so creative Jeanne. I love the tray. I even have a white tray. Wow; this would certainly make it unique. Thank you for a great idea! I love the effect with the stripes. 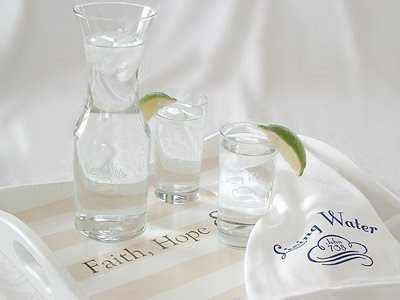 And there is something that says "sun and summertime" to me with a little carafe of ice water. Just lovely! Thanks for such a cute idea!! Adding it to the Nest Files! beautiful... do you ever run out of wonderful ideas?!?!? They would make incredible gifts! Thanks for the inspiration. Blessings to you! I love it! But what kind of sealer would you buy for that? The spray acrylic sealer? Yes, I used the acrylic spray sealer. Multiple coats. If you're really a heavy user and concerned about spills, I encourage you to take the time to brush on an acrylic latex. Wow, love this idea! Love the stripes too. Hello Jeanne - love that tray! So fabulous. Thank you for sharing! That tray is beautiful! I love the stripes! Pretty nice blog you've got here. Thank you for it. I like such topics and everything connected to this matter. I would like to read a bit more soon.